Hi everybody! It's Ruby Tuesday again. We had fun last week celebrating our year's anniversary. didn't we? I announced the winners of our prize giveaway and I've mailed the prizes to the winners. This is the stained glass window on either side of the entrance of Coe Hall at the Planting Fields on Long Island. I'm pretty sure it depicts Queen Elizabeth I of England. Of course I took the shot for the colors especially the RED color. Gold chloride and selenium oxide are added to glass to get the RED colors. So now we begin our 2nd year of Ruby Tuesday. Feel free to join us and to post a LOT of RED or a little bit. Don't forget to sign Mr. Linky, leave a comment and visit your fellow bloggers. We all love visitors! You know that! 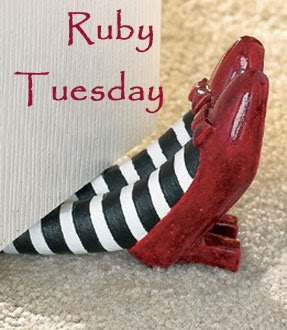 I will be posting Ruby Tuesday at 2:00 PM EST to make it a little easier for our friends in other parts of the world to post at an earlier hour. And here we go for the second year ! A great piece of art that portrait in stained glass. What a beautiful window. I love stained glass, and I love the way artists depicted all the sumptuous fabrics of the Elizabethan period, so this one is a double winner with me. I'm pretty sure you're right about the identity of the lady. She doesn't look as dour as she usually does though. Guess the artist caught her in a good mood or something. Queen Elizabeth I is my fav queen. What a beautiful window. 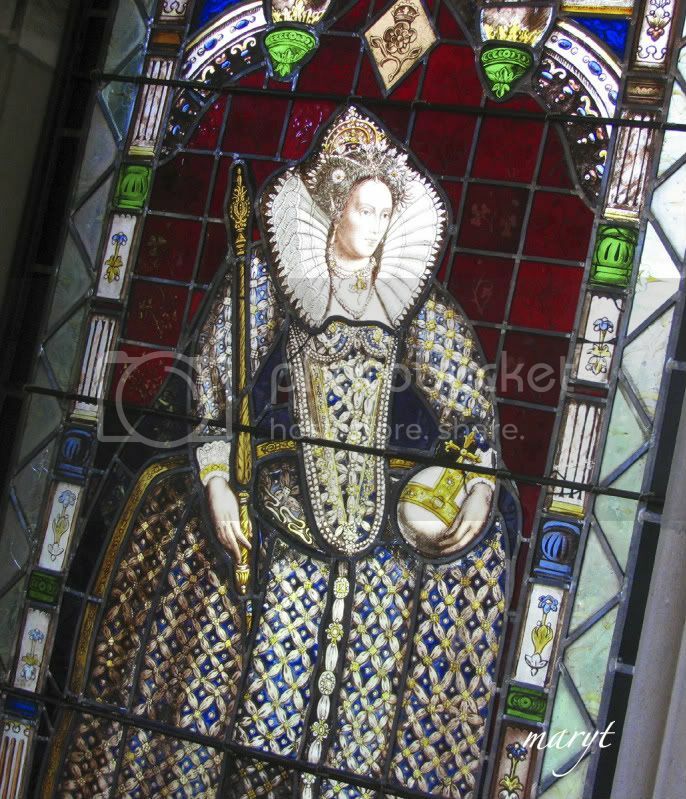 Great stained glass photo of Queen Elizabeth I. Best Wishes to Year 2 of Ruby Tuesday! Just linked up even though it's only 2 pm PT in LA! Thank you. That's a 'window of art' and it's beautiful ! Certainly looks like Queen Elizabeth to me! Or maybe it looks like Cate Blanchett in the film Elizabeth? A great beginning to Year II. Love the stained glass picture. I'd go for Elisabeth 1 too. Congratulations to the "winners" of year one. Looking forward to tag along for one more year. That glass is great, Victoria looking omnipresent and far bigger than life. Henry VIII's heir is quite impressive! I've missed being a part of Ruby Tuesday. I've been away but glad to be back. I'm looking forward to a new year of all things red. Love this window! A beautiful find. I love to look at stained glass windows. This is a neat portrait of the Queen. Happy to be starting Year Two with you! Thanks for everything, Mary. Congrats to all the winners last week. Lots of deep red color surrounding the Queen. I love looking at stained glass! It almost doesn't matter what the subject is. When I first saw your photo, I was thinking you had recently been to England and took this photo there. Very regal and beautiful. My mom used to make stained glass lamps, windows, etc and I remember red glass was difficult and expensive to get. She's very regal, an apprpriate queen photo for you, the queen of red that you are. Thanks for great meme, and congratulations on beginning your second year. Hey, I posted one this week! Nice shot. My Ruby Tuesday is here. very beautiful stained glass!! Queen Elizabeth is really elegant there. Am looking forward to 2nd year of Ruby Tuesday and am posting my 2nd entry now. Beautiful photo. I love stained glass! Okay, so I don't see Mr. Linky, so here's my link, and I will go look for Mr Linky some more! First time here, and, by coincidence, I've just celebrated my first blogging birthday too. Onward with the 2nd year...and many more to come! My little Emily is the focus of our RT this week @ CrAzY Working Mom.com. Hope you'll come take a look. Sorry about the double link in the Mr Linky the first one is not working for some reason. This is my first time playing Ruby Tuesday! Those old windows are so incredible with all their details and the time it must have taken to do. All the history just flies in front of me. So sorry that I missed out on the anniversary post. Best wishes to Mary and her meme. Love the window. My husbands mother was an artist that created stained glass church windows for a living. The amount of work that a window like this would have taken is astronomical. Hats off to the creator. Wonderful window - I hope I can go around to many churches this holiday to come, and look at teh window. Have a nice week, MB Sweden. Happy anniversary Ms. Mary! That is such a beautiful window! My creamy and yummy RT entry is up. That is a beautiful stained glass. Imagine the work that went into it. Mary! This stained glass window is absolutely phenomenal! I nlogged about Henry VIII today so I was especialy happy to see Lizzy 1! That's a nice window, great shot. Lovely Elizabeth. What a woman! Stained glass, How wonderful. i always love this art.So many details. I did not see Mister Linky to link, so I linked this comment. Beautiful color of red in the stained glass art. Thanks again for creating Ruby Tuesday! That window is magnificent! Triple wow factor. The red glass is very rich in color and texture, great shot! I love stained glass and this is a wonderful work of art! That is a beautiful stained glass window. Thanks for sharing. This is my first time joining Ruby Tuesday. My photo blog is new. Thanks for hosting this! Beautiful window, by the way. And, congrats on what looks like a great first year. What a lovely photo of a beautiful stained glass window. Wow! Mary, THAT is very beautiful! I have a red post up now! Come visit! I love stained glass... when we get our garden room addition on, it will have art stained glass accents in the cupola and in the door transoms... I can't wait! Beautiful window. I would guess it is breathtaking when the light shines through the stained glass. Thanks for sharing and hosting RT. Mary, thank you again for doing RT. Even if I didn't win your prize last week I will still participate when I have the time. Mrs. Jim and I like those Strawberry Fields right there in Central Park. Most every time we come to the park we go there. We also visit the lake where Santa landed his sled one day in the movie, Elf. Beautiful stained glass - so intricate. Your Window is beautiful!!! Really looking forward to another year of Ruby Tuesday! Have a great day!! Gorgeous stained glass and such an unusual item to post Mary, I would love to see this up close! Beautiful work of art. I love stained glass and I love your shot! What a cool stained glass portrait. I was just at the Stained Glass Museum on Navy Pier in Chicago on Saturday, and didn't have my camera! Mine is going up late, but it's still Tuesday in my neck of the woods for a few hours yet! I've always loved watching the sunlight stream through red stained glass. This is a magnificent window! Love this window! I'll have to find it to see for myself next time I'm on the Island. I'm playing again. Happy RT! Happy Anniversary! I love the brilliant colors in the stained glass. Thanks for sharing.